“Poetry in motion” comes to mind when I see today’s prompt. I’ll probably have the song stuck in my head all day. 🙂 But for a photo of motion, I offer you this one taken at Omaha’s Henry Doorly Zoo last year in a visit that yielded a plethora of photos of a wonderful day. I’ve been waiting to use this shot and today’s the day! The photo’s unedited except for the color at the edge. K.Z., I was taking shots as fast as my phone would to! They were so beautiful. Ha, Allan. They are a bit, although thinking of it that way makes them seem a bit dated. 🙂 Glad you liked the photo, though. They were so beautiful and graceful. The place was crowded or I would have stood there much longer. Thank you, Adhika, and thanks very much for not only visiting but for commenting. No worry Janet. I haven’t been to an aquarium for a while. I probably should. I kind of wonder how long exposure would look like on jellyfish! I bet you’d get a beautiful blur of movement. You’ll have to give it a try. Beautiful colorful picture. That would be a treat to see the rest of the photos. I hope there will be a chance this summer. I’ll try to do that, Julia. Thanks. Janet, just one word; WoOoOoOoow! Absolutely amazing image. And the vibrant colors … somebody has said that there is more colors under water and on earth. Thanks for that one word, Viveka. It’s much appreciated. The color was magnificent. Jellyfish are surreal. When I think of alien beings- which is not very often- I think more along these lines. You’ve done a great job capturing this one! Thanks, Emilio. I agree they’re surreal, not really like anything else and don’t really seem like living beings. Aliens would be an interesting interpretation and they live in an environment alien to us. Thanks for dropping by and commenting. Enjoy your weekend. Thanks, Lisa. It was one of those shots that truly conveyed the beauty I saw. That doesn’t always happen so it made me happy. Thanks for the visit and comment. My pleasure. I’m sure touching one would be a very bad idea, but I know what you mean. Fortunately for everyone, these beauties weren’t accessible. So cool! It’s a stunning photo for this amazing creature! Thanks. I’m so happy you liked it. Thanks for the visit. Much appreciated, Sonya. It was a beautiful sight. 🙂 Great picture! It looks almost spooky, but definitely very alive! No, you don’t, Sandra, so I will cherish this comment greatly! Thank you so very much, Joanne. That makes me happy to read. This photo takes my breath away, Janet. Beautiful! Thank you very much, Marion. That’s a lovely compliment. 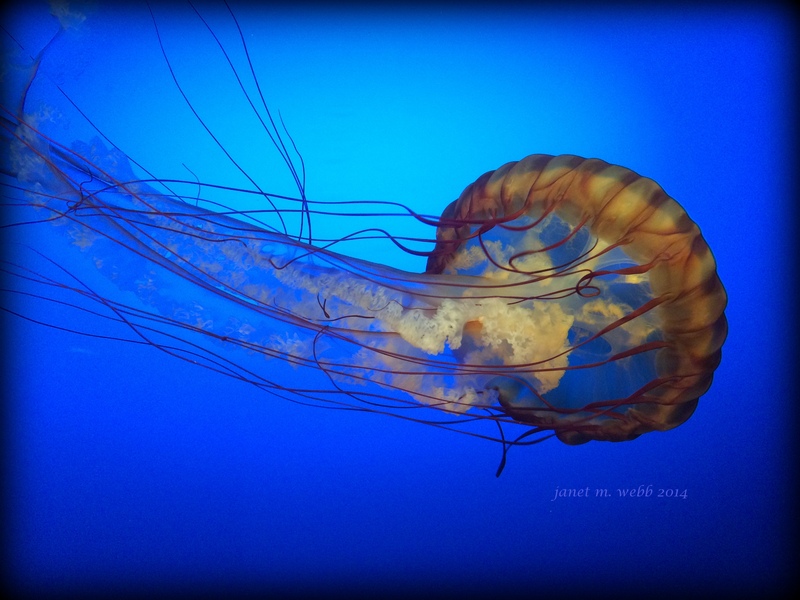 I’m only happy I could convey the beauty I saw at the aquarium. What an amazing shot. Love it so much. I’m so pleased, Raewyn. Thanks. This is utterly gorgeous Janet. Wow! Then I managed to share the feeling I had when I saw this “guy” and his? cohorts. It was breath-taking. With her hair flowing out the back…or being blown off her head. 🙂 Glad you like it. Great shot, Janet! I love those jellyfish! Thanks to the great underwater shooting expert! Wonderful colors and shot, Janet! Stunning picture! The colors are exquisite. It’s some form of Jellyfish, right? Thanks so much, Karen. Hope your weekend’s off to a great start. What a wonderful photo. It would look brilliant printed out and framed. Thanks, Suzanne. I’ve been thinking of looking into that for some of my photos, so thanks for the encouragement. Lovely! I’ve linked so my readers can come see too. That’s so nice of you, Dawn. Thanks! Thanks, Randy. Hope you’re having a good weekend. I’m indulging in some hockey immersion. It was like watching a ballet to see them all swimming around. Very nice. I’m glad you found a place post it. I’m happy you like it. 🙂 A happy Sunday to you. A truly great capture – fabulous! Thank you so much, Leya, and for stopping by so often. I really appreciate it. Janet…I know i know – I’m a hopeless case this year. But I’m planning on retiring this autumn – more time for us all! Leya, not only are many of us busy, but when spring comes, it’s just wrong to spend too much time online when nature is calling. And real life is so important! Great news on your retirement, though. Any big plans? Get to know my husband again…I’ve been working so hard for many years and I believe it requires some time and effort to find each other again. If we stay healthy, we will go travelling together like in the old days. First Switzerland and Scotland this summer, and then back to China. A big country that takes many tours to get to know a bit better. This will be our 4th or 5th trip. That sounds wonderful, Leya, and the best use of time: love + travel. I can’t wait to read about your adventures. You are very kind – thank you! Thanks much, Nicole. That means a lot. I love this picture. I took a picture of a jellyfish once and it didn’t come out as beautiful as this. It was white and ghostly … and the picture was quite pixellated so I never used it. As this one was in an aquarium, it was probably much easier than trying to get one “in the wild”, if that’s what you were doing. At any rate, I was fortunate to get something that turned out so well. Thanks. I wasn’t getting one in the wild. It was a fish tank in a Thai restaurant in Birmingham!! Thank you so much for saying so. 🙂 And thanks for visiting. I appreciate it. They’re a bit odd looking, aren’t they? Another remarkable shot Janet. What sort of IPhone do you have. My very old IPhone 4 is slowly dying and I am wondering what to get next and I love the photos you are getting with yours. I am looking at a 6 iPhone that is now reduced to half price and I am impressed with the photos your phone takes, my 4 is no good at all for photos. The cameras just keep getting better, although I’ve read that the Galaxy has an even better camera than Apple. Gasp! !